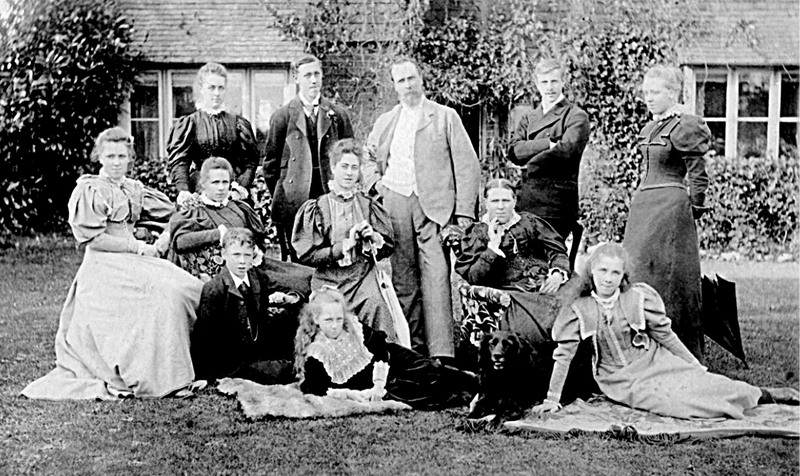 My Collier family originate from Witney Oxfordshire where for centuries they were major weavers and blanket-makers. It was from the mid 1830s that they first moved to Frieth, when Sarah Collier and some of her children moved to the village from Stokenchurch, after her husband William, a Surgeon was transported to Tasmania for fraud against the Bank of England. Their son Thomas married Frieth resident Hannah Barlow at Clewer Church Windsor in 1840 and moved into what is now the Yew Tree. In 1843 Thomas George Collier, the co-founder of West and Collier was born, although his birth was never registered, only his baptism at Ackhampstead Chapel on Moor Common. Unfortunately in May 1853 Thomas senior died of T.B., leaving Hannah to bring up their six children on her own. While the Collier family had been fairly well off before moving to Frieth, young Thomas was said to have only had one day's schooling in his life. During stays with his Grandmother Sarah, who by now had moved to London, Thomas said he would turn cartwheels in the street for the amusement of the passers by, thereby receiving an odd halfpenny to help towards buying food for the family. After his father's death, to earn extra for the family, young Thomas would scare birds in the fields and generally work on the farms around Frieth. He said he even stole mangles from the fields because he was so hungry. Then one day he told his mother that he wanted to learn the trade of chair making. With this in mind, Hannah arranged for Thomas to work for Samuel Sears of Lane End; so this is where he learnt his trade. It was said that Hannah used her funeral money to pay for his indenture fees, even though she had been left two hundred pounds in 1858 by Sarah her mother-in-law, “for the betterment of her nephews and nieces”. This was a considerable amount of money at the time. Thomas would have been fifteen when his Grandmother Sarah died, so it’s more likely it was her money which really paid for his apprenticeship with Mr. Sears. Thomas and the family outside the Firm in 1895. In 1869 and at the age of twenty-six, the same year he married Mary Ann Ellis, Samuel Sears’s niece, Thomas together with Edwin West and Joseph Barksfield, decided to start their own furniture business in Frieth. This was on land that had belonged to Elizabeth Lewis but let to William Barlow, Thomas’ uncle. After a short while Joseph Barksfield decided to call it a day, leaving West and Collier to continue on their own. Usually Edwin would remain at the factory, while Thomas would tour the country searching for orders. Eventually their workmanship became so well known and respected, that not only were their chairs font-covers, and lecterns to be found in Cathedrals and churches around the British Isles, but around the World too. The only British Cathedral that wouldn’t accept their chairs was St. Paul’s in London, even though they were offered some free of charge. This refusal meant that West and Collier were never able to claim that they had chairs in every Cathedral in the British Isles, although they did try. Its amazing to find many of the chairs which were supplied to the Cathedrals and churches still surviving and in use today, such as 120 of the 150 which were supplied in 1905 to the Abbey on the Isle of Iona in Scotland, or the dozens of chairs dotted around York Minster. the seating capacity was said to have been 523 including the choir. In November 1888 West and Collier also supplied the chairs to the new church of St. John the Baptist in Lower Caversham. Around 130 of the original 150 or so wooden seated chairs are still used today, all with book holders and under-seat hat rails. They were all made and initialled by three men; RH. JJ. and WG. These men were probably: 37 year old Robert Higgs senior of Little Frieth, James Jones of Spurgrove and Walter Goldswain of Perrin’s Spring. Another place closer to home to get a view of a few West and Collier chairs is at High Wycombe Parish Church where quite a few rush seated examples, supplied in 1877, are still in use. In both these churches and the others around the country, their chairs are a long lasting testimony of the workmanship of those residents of Frieth who have now gone, but whose skills are there to see after all these years. In a report written by Charles Booth who was investigating poverty in London in 1889, he noted that West and Collier of Frieth had been in business for around nineteen years, and that the nearest other business was a mile away. He also mentioned that all the West and Collier work was done by hand, while at Wycombe a great deal of steam power was used. This hand work would have included everything from the sawing of the trees into planks, to turning the rails on pole-lathes. The only part of the production that wasn’t done at the factory was the caning and rushing of the seats, this being done at home by the workers wives and children. One other piece of fascinating information in his report is that the payment for this work was paid in the form of a food deal or voucher. This presumably would only have been valid in Charles Webb’s shop and bakery, which was partly owned by Thomas’ brother Edward Collier. Their sister Sarah Neighbour also had a business in the village, but I believe only sold chinaware and maybe clothing. Looking back on to it now, it looks as if the Colliers had a bit of a stranglehold on the village resources. Not only did some of the workforce rent their homes from West and Collier, but they had to buy their provisions from the Webb/Collier shop. Although this seems an awful abuse of power now, in those days it wasn’t unusual to be paid this way. Most Victorian factory owners ran the same sort of shop enterprises for their employees. Proof that the firm was doing well in the early 1890s was when West and Collier purchased some cottages in 1892 for their workers, followed in 1895 with Thomas Collier buying Frieth Farm from Mr. Scott-Murray of Hambleden. 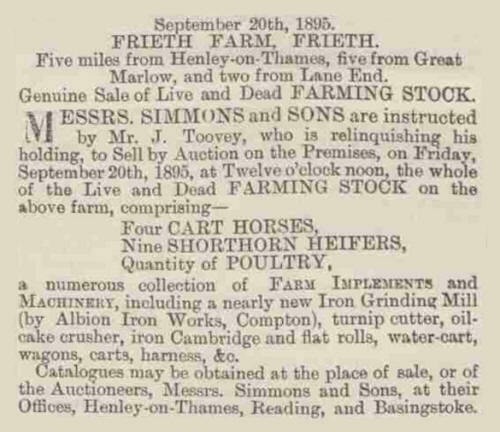 The advert for the sale of the stock prior to him buying it appeared in the Reading Mercury in September 1895. 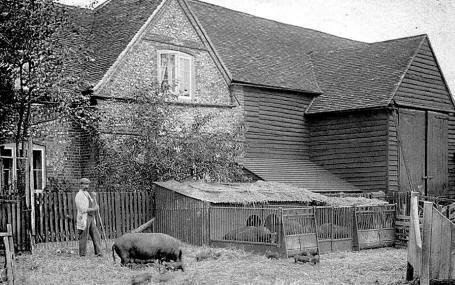 Pigs in the farmyard at Collier’s Farm, circa 1900. A report of a sale of property by Messer’s Simmons and Son of Reading, reveals that West and Collier also paid £370 for three cottages and a paddock in Frieth in May 1899. During the first half of the 20th century Cutlers, Yew Tree and Little Cottage were owned by Thomas Collier of Frieth Farm. Little Cottage was the cowman's cottage, while Yew Tree Cottage was the ploughman's. As you would expect, and I will say it, West and Collier were not always that bad as employers either. In July 1897, 40 employees and the families were given a days outing to Bournemouth. They joined 560 other people, when the Henley Choir organised an excursion from the Railway Station. They arrived at Bournemouth at 10 o’clock in the morning, and left at 8.15, arriving back at Henley at 11.30 in the evening. This trip was probably instigated by Thomas Collier as he is reported as a man with a great singing voice, so would have personally known the Henley Choir. Another Farm which Thomas purchased around that time was Manor Farm at Fingest, although it isn’t known exactly when. According to the Reading Mercury of November 1897, it was to be let together with 197 acres of land. Twenty acres of which was grass, the rest being arable. The agent at the time was Mr. John Tudor of West Street in Marlow. In June 1907, James Leaver, farmer and then occupier of the Yew Tree Inn, took West and Collier to Court, claiming that they were not entitled to a strip of land which formed the boundary between a West and Collier meadow and his called Spurgrove Meadow. He argued that the ditch and hedge was and always had been part of his meadow. After several witnesses spoke on behalf of both sides, the Judge at Reading, after agreeing that they should not waste time over such a paltry case, decided that Leaver should have the land. He was also awarded the cost up to a total of £10. Thomas Collier giving his evidence said that he had known the place since he was seven years old, and that they had owned it since 1892. John Toovey who was the former tenant of the West and Collier meadow said he never claimed the hedge as he thought it went with the Yew Tree. I’m sure Thomas should have known the boundary as he lived in the Yew Tree as a boy. At the beginning of the 20th century a small book was written and published by the then Parson of Frieth, the Rev. O. J. Jones, called, “A Village Industry” [ See West & Collier Catalogues in the left hand menu ]. In it he tells us that except for those who worked for Lord Parmoor, West and Collier employed practically all the villagers. The men in the workshops or on the farm, while their wives still did the rush or cane seating at home. Chair pattern numbers; 1, 2, 3, 4, 5a, 5b and 6 from the 1907 catalogue. Although it was the beginning of the twentieth-century, it was only then that West and Collier made it into the middle of the nineteenth-century. The arrival of a second-hand steam engine at the factory in 1905 was a step in the right direction, but even then it was only used to increase the production of a product on the decline. By 1901 Archie Collier was increasingly making a name as a carver as well as a designer. 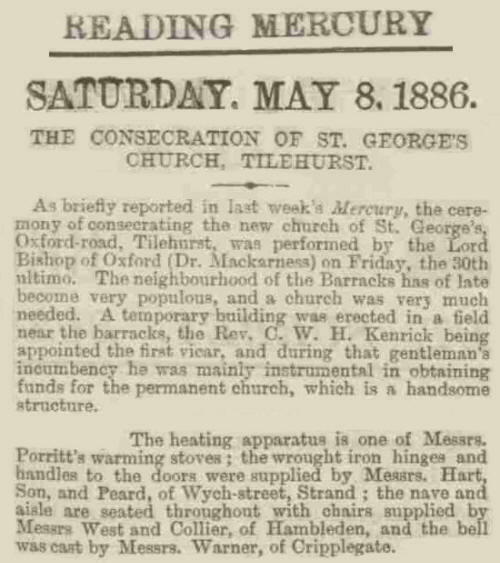 This is backed up in the Reading Mercury of March 1901, when Archie was awarded first prize at the “Henley Industrial and Art Exhibition”. The prize was in the “Open entries for carving”. What the actual carving was isn’t known, but it must have been good, as entries came from as far away as London. Sadly it seems that from around this time major disagreements arose between the Colliers and Wests. Collier family legend has it that Thomas finally fell out with Edwin West after he set his son Percival up in opposition at Moor End. This rival factory, “The South Bucks Church Seating Co.” was not only in competition with West and Collier, but Edwin would also give them work to do; not the wisest thing to do when you are in a partnership. This rival factory was in operation from around 1912 until 1916, when it closed after Thomas Collier moved lock, stock and barrel to the Farm. Percival promptly moved into the Collier’s home, closed the Moor End factory and moved his men to the West and Collier factory. Looking at it after all these years, it really does look as if there had been a power struggle between the Wests who wanted to continue making Church and Hall furniture, especially as they started another factory making it, and the Colliers who wanted to branch out into "Arts and Crafts" and "Art Nouveau" household furniture; some of which they made; including bedroom furniture for Lord and Lady Hambleden at Hambleden Manor. With the introduction of domestic furniture, the Colliers, and especially Archie Collier, look as if they wanted to safeguard the firm's future by expanding the items they were making. To help and ultimately bring the Company into the 20th century, they even acquired the old steam engine, although this would never have safeguarded the long-term success of the Company, it was the product range that would have done that. One small but interesting piece of information relating to household furniture at West and Collier comes from the 1911 census. It tells us that sixteen year old Walter Simmons of Little Frieth was a household furniture maker, while his father worked as a church furniture maker. Could this be the proof that Archie Collier was trying to employ staff for the more skilled cabinet making side of the furniture trade? Even Archie referred to himself as a cabinet maker, rather than a Church furniture maker. 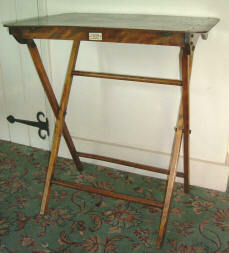 The idea of the Colliers wanting to increase the range of products is also proved by the West and Collier catalogue of 1907 where it shows that not only did they make chairs designed and Patented in 1905 by Archie Collier, but they were willing to use other people’s designs, including those of the Oxford architect Alfred Mardon Mowbray. His designs included churchyard gates, altar rails, choir seats, and Lych-gates. In fact the Lych-gate at Frieth is one of his designs. The catalogue also shows West and Collier supplying baptismal fonts made from Corsham Bath stone, Caen stone or Beer stone. While these wouldn’t have been made by West and Collier, they would probably have been installed by Archie Collier and his team of men. A brass and metal fittings catalogue was also available, but if you preferred you could view these items in the Firm's London showroom at number 6 Henrietta Street, Covent Garden. Although it’s only speculation, I now wonder if the dispute had been pre-planned to oust the Colliers from the Company. The Wests must have known that starting a rival factory was going to cause trouble, yet they still proceeded. I suspect the problem was that the Colliers, especially Archie wanted to diversify into household products, while the Wests didn’t. It wouldn’t have taken much to realise that the Victorian obsession with building and renovating churches had ended and that the only way to survive was to diversify into the more profitable spheres of the furniture trade. The Colliers must have known their furniture wasn’t going to be replaced, but fittings such as, lamps, candlesticks and crosses might have been in demand. Therefore was it the Wests who finally pulled the plug on the church fittings showroom in Covent Garden? Apparently it had been run by Archie Collier, so I assume it was a Collier inspired venture. While it almost certainly wasn’t a great retail success, the idea of branching out into other products had been a good one, even if it hadn’t had the backing of the Wests. Archie took out a patent in 1905 for "Improvements relating to Folding and Portable Chairs, Tables, Stools and the like" and examples of the folding chair can be seen in the West & Collier catalogues. After Archie left West and Collier, he moved his workshop to his house at Moor Common where he lived until his death in 1942. At first he continued making domestic furniture, and in 1916 updated his Patent of 1905. Eventually he concentrated on property and house development, including building the houses in Hayles Field, but has now been recognized by the High Wycombe Furniture Museum as a furniture maker in his own right. Why the Rev. William Henry Ridley backed Thomas George Collier when he started the factory at Frieth was always a bit of a mystery, but it may have been because of Thomas’s grandfather, William Collier who was the Doctor/Surgeon at Stokenchurch. William would have known most of the gentry around the area, including the Rev Henry C. Ridley at Hambleden. In 1830 it was suggested that the Rev. Ridley took his family, and presumably his fourteen year old son William, to Lane End to avoid a cholera epidemic which was raging in and around Hambleden. Was it Doctor Collier of Stokenchurch who suggested that they went there? Unfortunately for the Rev. Henry Ridley, he didn’t stay there and returned to Hambleden where he caught the disease and died in 1832. It was his son Rev. William Henry Ridley who in 1869 backed Thomas G. Collier in his furniture making venture at Frieth. Rev. William Henry Ridley was the same age as Thomas G. Collier’s father, Thomas, both born in 1816. Thomas Collier senior would without doubt have known William Ridley from his days at Stokenchurch when his father was in practice there. For that reason is it possible that after Thomas Collier senior's death of T.B. in 1855, the Rev. Ridley took a close interest in the welfare of the Collier family, especially twelve year old Thomas George Collier? I think he did, and that is why Thomas named his fourth son, born five years after the death of the Rev. Ridley, Victor RIDLEY Collier in his honour. Rev. William Ridley must have believed that Doctor William Collier had done all he could for his father Henry before his death, so in return he did what he could for his grandson, Thomas George Collier. [ I would add that, according to Joan Barksfield's research, "Rev. W.H. Ridley was Rector of Hambleden who, like his father before him, was a progressive cleric convinced of the necessity of improving the lot of his parishioners both in body and in mind" He was the driving force behind getting both the Church and the School established in Frieth and I feel sure that he would be enthusiastic about supporting a business which would bring employment and much needed economic benefit to Frieth.